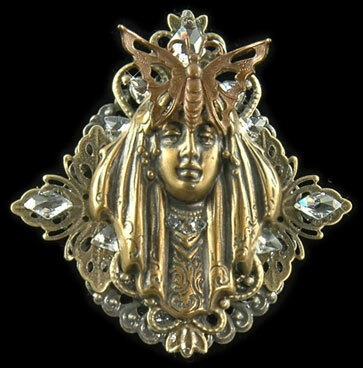 The wondrous and beautiful Butterfly Queen is intricately etched and detailed in antiqued gold brass with a very art nouveau feel. On her head she wears a butterfly crown proudly for all to see. She is resting on a bed of ornate French antiqued gold brass filigree and surrounded by delicate clear Swarovski crystals. This has a pin back but you can also wear this as a necklace using the two loops for your favorite chain. Measurements 3” L x 2.5”W.